If you are looking for a chiminea you can cook on the Chaos chiminea could be for you. The Chaos is the UK’s ONLY Chiminea with a one piece bowl design, it also features a one piece flue as well making it the biggest and heaviest chiminea in its range. The Chaos will burn in to the night and keep you more than warm as the night draws in. Due to the fact it has single piece bowl and flue it means you don’t loose any heat from the joints which you may find especially on competitor’s steel and die cast models. One of the major features is that once lit you can remove the flue from the top and using the grill plate inside you instantly have a barbecue! couple that with the fact you also have the removable grill in the bowl itself you can cook food on both grills allowing you to cater for more people than a standard chiminea. 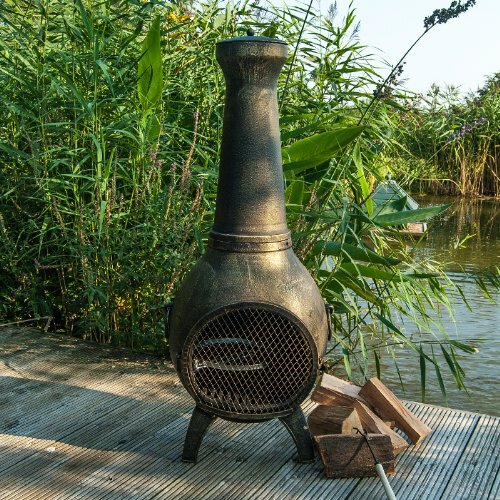 Features of the Chaos Chiminea include: Unique 1 piece Bowl meaning no assembly needed and no loss of heat through joints giving direct heat well in to the night. 24cm BBQ Grill between Bowl & Flue allowing you to cook food with ease alongside the removable chrome cooking grill inside the bowl which has a lip built around the edge to stop food rolling off and into the fire below. More details can be found here. Price: £199.95 from White Stores.